Bell Sympatico banned as a spammer. On the Bell network, want to send me eMail? Well you can’t. Apparently someone’s been using their Bell Sympatico eMail account to send spam, this got someone’s attention and they ‘punished’ them by adding them to the spammers list at uceprotect.net. My eMail provider and web host subscribes to the free list of banned servers that uceprotect.net provides, and good for them for protecting me. Shame on Sympatico for letting this happen. To get your IP off our List, you have to make your System stop sending mail to our Spamtraps first. There is no need for you to request removal, if you do not want to pay. Every IP at Level 1 will expire 7 Days after the last mail from it hit our SPAMTRAPS. This means your IP will be removed automatically after that period. If you do not want to wait 7 Days, you may request a paid immediate removal. Fee for this is 50 Euros per IP. Payments are accepted by Paypal only. Removal will be done by hand, as soon as Paypal tells us, they received your money. Click here if you want to request a paid removal. Here’s a copy of the eMail someone was sent back when my mail server declared bell’s server omts37.bellnexxia.net, 209.226.175.94 a spammer. 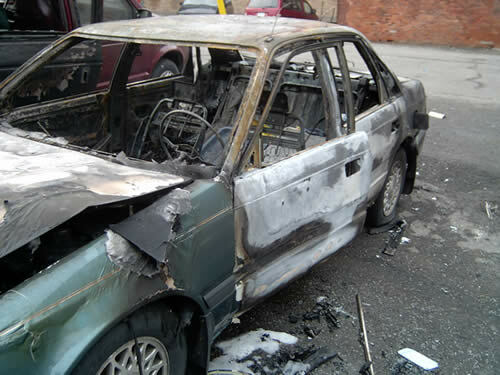 You might have heard me tell the story of my friends’ car that was torched by someone in Welland practicing random acts of arson. Giulia and Sean have put up this site at gforsythe.net with pictures and a request for help. My brother is now blogging for BlogTO.com – I’m already more interested in what he’s writing about than when he was just with his buds on exposed brain. He’s syndicated over >>> there somewhere, but BlogTO.com has interesting stuff to read in general. The good weather is….. well close, if not here yet. This weekend I’m going up north to Bancroft to spend the Victoria Day long-weekend with friends from Markham. With all those photographic opportunities, and the lack of in-doors we’ll have (well, that is, if you don’t count nylon and canvas doors) I thought it would be worth buying a polarizing filter for my camera. So I bought an adapter from my 16mm lens to a 52mm lens and a 52mm POL filter – it means I’m buying a lot more polarized glass, but I can put my fingers all over the outside 15mm! As my brother Adam and a co-worker Goldwin have explained it to me (because I don’t know any more than I can Google) a polarizing filter helps take pictures in the sunlight/outdoors. Specifically, it prevents light prom entering the lens at an angle, accepting only light which comes straight on. The filter should remove unwanted reflections from non-metallic surfaces such as water and glass. It should also enable colours to become more saturated and appear clearer, with better contrast. I wasn’t up for a drive down to the lake to experiment with this, but I did stop by a park on the way home from Henry’s. Here’s a small gallery for what it’s worth (again, without glass for water subjects). Pictures on the left (the earlier ones) are the non-filtered, the ones on the right (the later ones) have the filter applied. Marie Geddes started a hunger strike on April 25 after sending a letter to Alberta Preimer, Ralph Kline, to no effect. Her reasons for the hunger strike and letter were the lack of staff and service in the Bethany Long-Term Care Centre in Camrose Alberta. Recently she had been moved into a brand new building, which she said on CBC’s As It Happens, was a very nice building. The problem was the staffing had diminished and her daily living needs (the bathroom, etc) were becoming more difficult because the overworked staff was no longer available to help her. Her hunger strike lasted for four days, then her diabetes forced her health to take turn for the worse. She died yesterday after three trips to the hospital. It’s a sad commentary on health care in Canada. You are currently browsing the iMatt :: The Blog of Matt Clare weblog archives for May, 2005 .